Previous to my latest Y Block build, I had never had a block align bored. When I took my 292 block to the machinist, we found out it was a mess. One side was lower than the other and the main caps were walking around. The crank had been welded and the rods were mismatched. It had already been bored .040 over. These old engines have seen a lot of duty. Not all of them were assembled by the greatest mechanics. 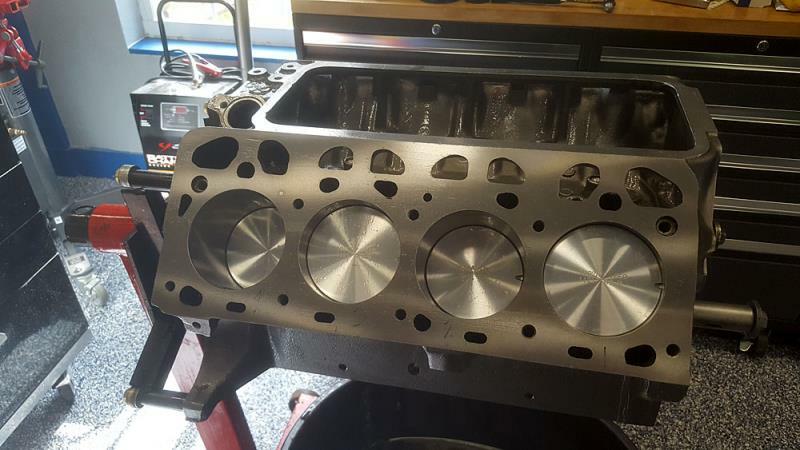 After much machine work, I was finally able to get a decent block. I combined another motor I had laying around, now have a decent motor that should last a while. Check everything before you assume anything. Here's another tip. Make sure your machinist has some Y Block experience. Few do. The loose caps have a memory for staying loose so they do want to resort back to the ‘collapsed’ value and remain loose if doing anything short of heating them up and getting serious with them. Prior to align honing the block with ‘loose’ main caps, here’s what is done to get those caps tight once again in their block registers. With the caps in a vise so there is an outward pressure being applied that temporarily expands the width of the cap, heat is applied with a rosebud torch. Once the cap cools, it is measured for width and compared to the width (register) in the block where it resides. If the cap is 0.002-0.003” wider than the block register, then all is good. If the cap still falls short, it’s reheated again in the same manner until the aforementioned press fit values are attained. This is a lengthy process and many times if one cap is loose, you’ll also find several others if not all that are also loose. Each cap must be individually worked on. What is this y-block magazine?? Any info you can give me?? It is a magazine supposedly put out by a guy named Bruce Young. A link can be found at the link button. Good luck contacting him, I have tried numerous times to subscribe with no luck, or he never gets my emails. I will not call as I do not hear well. Any info I need I can get here or from Ted's web site, but I am a voracious reader and pretty much read anything. 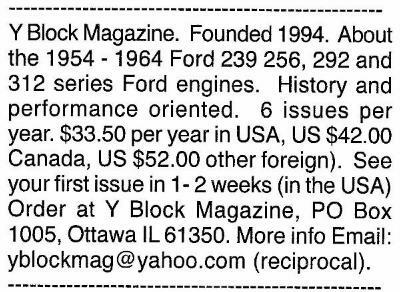 Y-Block Magazine has been around for twenty five years now. Bruce Young is the editor and essentially takes care of everything related to getting the magazine into the USPS system on a regular basis. 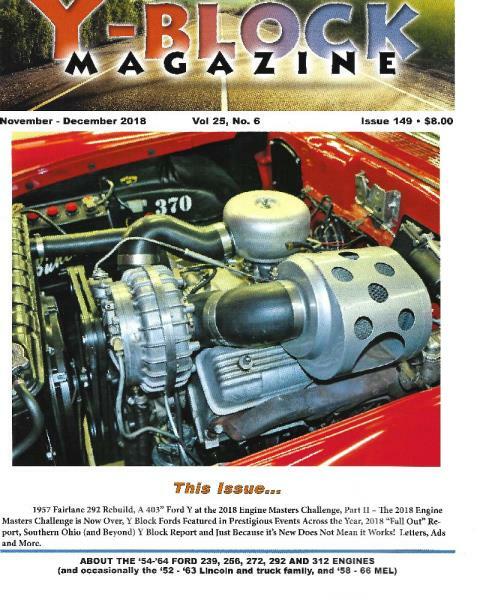 It’s published bi-monthly (every two months). Bruce welcomes Y-Block related articles so if you’ve got a story, put it in print and send it to him. Here’s the information to get a subscription. 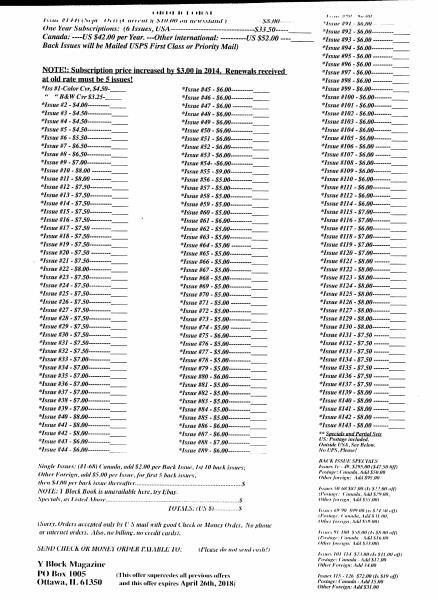 Here’s the form from a YBM magazine in which to order past copies. That form only shows up in random issues of YBM. And here’s the cover shot of the latest issue.